Let our team of Certified Google AdWords professionals eliminate wasteful spending and drive more high-quality traffic to your site by optimizing your PPC campaigns for the best performance by revising or sourcing top keyword, custom ad copy and providing advice on landing page optimization. With Google AdWords, we can continually test and tweak campaigns with an eye on the constant improvement of quality scores, ad rank, click costs and conversions. We also offer monthly comprehensive account audits with all key metrics analyzed and actionable recommendations made. PPC advertising delivers instant traffic by placing you at top positions on search engines. With Google accounting for two-thirds of all U.S. searches, AdWords remains the most effective PPC advertising vehicle. We can get you started on Google AdWords, or overhaul your existing AdWords campaign. Each PPC program involves complete development, from creation to optimization to management. Our approach to Google AdWords is simple. No matter how much you spend, buy the most valuable traffic first. Our fanatical focus on earning you more money produces real results for our PPC advertising clients. Goal Setting. We’ll help you with the objectives and define the most important actions your customers should take. Account Structure Development. Structuring your Adwords Campaigns allows us to better control how your ads will be triggered, when and where you want them to appear during a search. Competitor Research. We’ll use competitor research to help make sure that you are showing up when people are searching for your competitor. Geo Targeting Definition. Geo-targeting can be used to target local customers through paid search campaigns. Landing Page Optimization. We will ensure that your landing page is optimized to increase conversions. Conversions & Goals Set Up. Conversion goals are success events that occur on your website. They represent key actions that users take on your site and they are typically represented by reaching a certain page. Audience Creation & Set Up. An audience within AdWords is a means of segmentation or targeting your display campaigns, and it allows us to find the right people with the right message. More Traffic. You’ll get finely-tuned campaigns that consistently drive more traffic at the same or lower cost. Better Traffic. You don’t have to sacrifice quality for quantity. Lower Costs. We’re specialists in identifying and reducing wasteful PPC spending. Higher Return. It’s the high ROI our campaigns achieve that makes our clients look like rock stars to their boards and bosses. Monthly Reports. We report monthly on your campaign’s success, including impressions, clicks and conversions. Transparent AdWords. Easy to understand and track ROI with our transparent monthly management pricing and set-up fees. Google AdWords works best for any pool construction, service and retail company owners interested in lead generation. Earn up to 55,000 Points. Did you know that most pool builders pay well over a 30 percent markup on their Google account after management fees are added in? 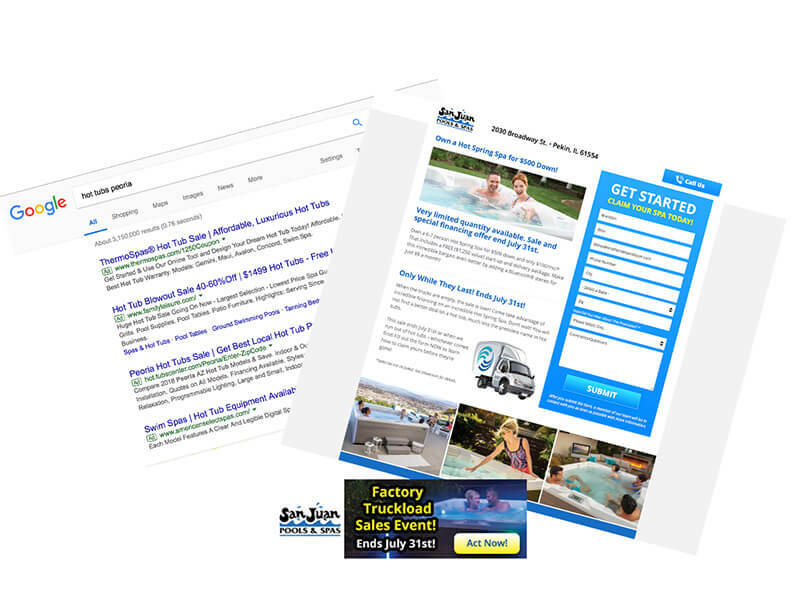 You can avoid the needless price hike and see your conversions soar with Pool Marketing Site’s Google AdWords service. One of our clients experienced a 50% reduction in the cost per lead, while another client experienced a 30% increase in the amount of leads coming in with a 20% reduction in the cost per lead.